It was so delicious. 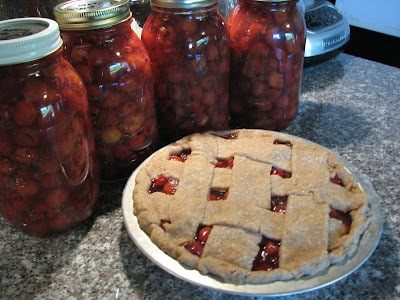 I used the recipe from the National Center for Home Food Preservation. I think that it's the almond extract that really makes the flavor pop. I was so excited when we went to Hentze Family Farm on Sunday and they not only had sour cherries but they also had the Clear Jel required for canning pie filling. Apparently there's no substitute that thickens like corn starch but doesn't behave badly during the canning process. They only have pre-picked, pre-pitted cherries for sale (how else is a farmer going to make a living except with value added products?) so the 8+ lbs. I bought (apparently an even 10 lbs. before pitting) were $22.50, a little richer than I usually buy my fruit. A total of $5 per pie for all ingredients starts seeming well worth it though when I dig into such a tasty treat.